GIVEAWAY: It's another giveaway for 3 $10 gift certificates to Restaurant.com! Just leave a comment on this post (any comment) either today or Sunday as well as a way for me to contact you. I'll pick 3 winners after midnight SUNDAY night PST (I take Sundays off from posting, so I won't post the winner until Monday....you have TWO days to enter.) GOOD LUCK! ...and keep coming back because more of these to come! ALSO, you can win more than once! FREE FOOD ... Einstein Bros Bagels will send you a coupon for a Free Breakfast or Lunch Sandwich when your friends sign up to Einstein Bros. e-club!! The coupons expire within 5-7 days so use them soon! Keep your eye on your inbox! I just received my FREE COFFEE from Dunkin' Donuts a few days ago. They are out of the Original Blend, but I like the Dunkin' Dark better anyway! GOOOOOOOD coffee! Free Samples from Walmart.com! Mmmmm the new Gain smells soooo good! The T.G.I.Friday's Give Me More Stripes Campaign entitles diners to a coupon for a free appetizer, a free one-time "front of the line" pass and the ability to earn "stripes" for each dollar spent at the restaurant. COOOOOOKIES ... Eight free Holiday cookie recipe cards. I posted a deal on Spode Christmas Tree Pedestal Goblets yesterday from the Friday Sale. 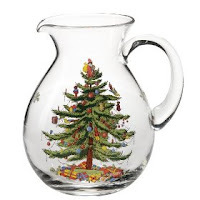 Just found this pretty Spode Christmas Tree Glass Pitcher on sale, too! *Tons more Spode items on sale! Home & Garden Markdowns - Click on the department of your choice on the left in order to narrow your search. I am going drinkin' and mechanical bullriding with my BFF and our guys tonight, can't wait! should be a total blast! wanted to YOU about a giveaway! come on over to my blog- one of my books, and three other prizes are being offered- it's time you were up for a prize!! now i'm off for free choc covered poms!! Thanks for the link to the Dunkin Donuts coffee!! I buy avon stuff for my mom all the time. Thanks for the free shipping code. The Spode collection is gorgeous! I'm addicted and don't have that pitcher!! THANK YOU! Love the freebies and my email is j.sherritt@tx.rr.com !! oh! thank you so much for my winnings!! so excited! also i wanted to let you know i bought my mom that pitcher after you recommended the spode glasses the other day! :) it's good stuff. so double thanks!! WEll... I took pix of some munchkins, cute ones too... and I plan on being lazy with hubby! can't beat that. It's a catch up day for me! Please enter me in your drawing! thanks! Great website, wonderful give-a-ways!I plan to just relax and watch cmas cartoons with my family. My weekend has consisted of a night at Trolley Square, birthday breakfast for my dad, I'm hosting an 'ugly sweater party' tonight, going to see the Mormon Tab Choir sing tomorrow morning, going to church, then decompressing after being so busy! FYI - Melissa & Doug easel is now $25.99!!! My plans is resting in the house as the storm comes in! My kids are going nuts so I may have to go to the mall! My ex loves Dunkin Donuts coffee. It would be sweet of me to send him some. Boring, boring weekend. Didn't do much of anything today, and I work tomorrow. I know you already know that I really like all things Spode and that pitcher looks fantastic! Love it. Cool giveaway! I just came over from SITS - great blog! I really enjoyed my visit to your site. You have some neat gift ideas and I love your giveaways!